Hello, I apologize but I’m hoping someone here can help. I went through the live streaming instructions backwards and forwards. I’m not on my second Theta because I assumed the first one was a hardware issue. I cannot get the UVC Blender to work. It installs and registers the camera no problem. But if I select it as a capture device using any application I always get the same error screen that says “Theta UVC Blender Status:0x800705AA” in white writing on a black screen. I get that error message regardless of whether the camera is plugged in, what order I plug it in, if it’s in live stream mode, etc… it’s as if the UVC Blender just refuses to see it. I’ve tried this on my Windows 7 machine with both the 32 and 64 bit versions of the blender. I’ve also tried it on 2 different Macbooks with the same problem. It’s running firmware 1.5. 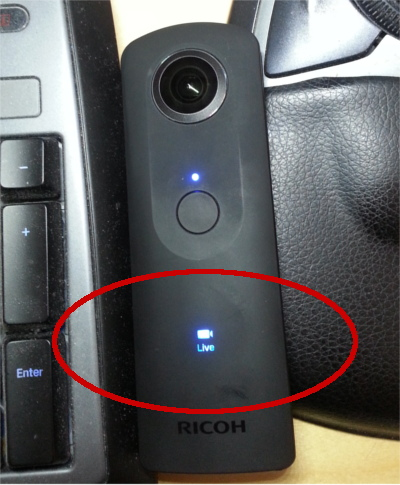 I saw someone in the Ricoh support forums had this issue as well but no one has solved it. I’m even emailing with the product manager at Ricoh and he seems not to really understand the issue. I’m desperate here as I have an application I am developing and this is the only camera that fits my requirement. This error occurs when the connection from the THETA to the computer is not established. Test to make sure you can stream an equirectangular video and display it locally with just OBS, not YouTube. A blue Live light needs to be on. THETA UVC FullHD Blender needs firmware 01.82. If you have an earlier firmware, upgrade using this guide. Thanks for the reply, Codetricity. I have tried everything you suggest and nothing works. The camera is detected by the OS but only as a camera with storage. Meaning, I can open it up and see whatever is stored on there, but it is not recognized as a capture device. Any application (such as OBS) that sees a capture device only sees the UVC Blender, not the Theta itself. I think that’s part of the problem. The OS doesn’t see the camera as a capture device and therefore the UVC Blender has no source. Which is strange because it ‘registers’ fine when I run the Theta registration app. One thing that did strike me is that you said it has to be in ‘live streaing mode’ a a blue ‘Live’ light needs to be on. I don’t get a ‘Live’ light, I just get the blue videocamera icon and the blue dot that it’s ready. I’ve seen pictures of the actual word ‘Live’ lit up before but I don’t know how to make that happen. Am I missing that? Lastly, all my computers only have USB 3 ports. I can’t imagine that is a problem since it’s 100% backwards compatible, but just in case I plugged an old USB 2 hub just to test and that didn’t work. I got it! It was the ‘Live’ streaming mode that I was missing. I just watched a tutorial that explained you had to press the power and the streaming button together to get it to work. I feel like such an idiot. Thanks for the tip! another question if you have any guidance, the latency going through the UVC blender is pretty high, about 3-4 seconds. Do you know if there’s any way to cut that down? maybe encode at a lower resolution or frame rate? Awesome! So glad you got it working. The main thing is to have fun and keep learning. Everyone has the same problems of not pressing a button or not checking a box, or some configuration setting. I hope that by documenting problems and solutions here and making it publicly available, it will help more people. I think it is common for people to not press the buttons for live streaming. Thank you for sharing your thought. I have the same latency of 3-4 seconds on my test system with YouTube. If you’re trying to do an immersive experience, you may need to bypass youtube for machine to machine streaming. I will try your suggestion but I’m not sure how it will help. The delay is caused by the UVC Blender, for the most part. If you open up Graph Edit in Windows, it gives you a direct path to the DirectShow element and when I render it I can see the delay. This is OS/Application delay, not YouTube. I suspect it’s doing a few things… first, the camera has to take the raw frames and encoded into motion JPEG, which adds a little bit of latency. Then it hits the OS and gets decoded, which adds more latency… then the UVC Blender has to take it and stitch the whole thing together in realtime, which I suspects adds the bulk of the delay. I have a pretty fast machine but I figure the application itself isn’t particularly optimized. You can measure this by timing the difference between the direct ‘2 sphere’ capture and the UVC Blender… they’re about 2 seconds apart. I’ll be able to live with the latency, I just wish it was lower. over the network is a dual-fisheye stream. I’m not sure if it will help. a test phase too, so not as established as YouTube. of UVC Blender. I have not tested it extensively. thanks. it’s good to know that they’re doing it in JS… that gives me hope. Contribute to video-streaming-sample-app development by creating an account on GitHub. FANTASTIC! I suspect this will help a lot. Chrome has tons of graphics optimizations so I suspect it will perform much better than the implementation in the blender. Thank you so much! Chrome for your tests. It may help. Do you have firmware 1.82 installed on your camera? if not, use the desktop app. Does it work with Skype or Google Hangout using the THETA S driver, not UVC Blender? if so, it’s a problem with the USB connection, the physical wire, the USB port of your camera, or the computer. The firmware may be the problem. Updating firmware (1.82) is OK for me. Thank you for your success report. I made an error. As you correctly indicated, 1.82 is the version that supports UVC FullHD Blender. I’ll update my post above to reflect this. Appreciate your information contribution to the community. Hi there, I had done all the things you said were, the camera is in live mode, I had changed the cable, registed the camera with the blender, installed obs and everything is ok. 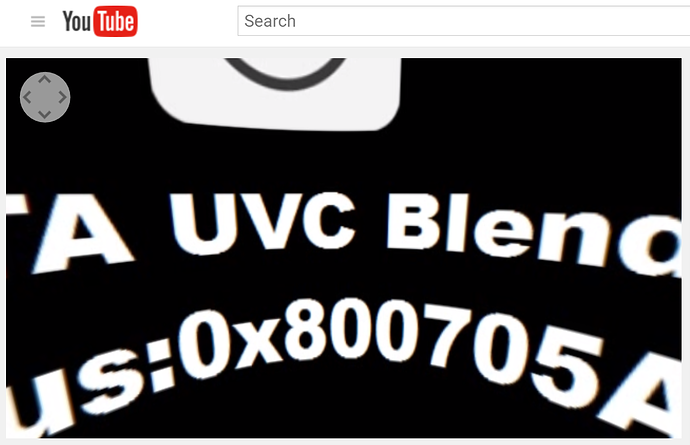 The fact is "THETA UVC Blender Status:0x800705AA message is appering insted the image, also switched between normal pc webcam to UVC HD Blender and nothing appears. There is a red light when on live mode (power button). What version of firmware do you have on the THETA? Did you read through this guide about the new upgrade? Please confirm you are using a THETA S and not THETA SC. The camera should be black. A bit more information that may help. The error above occurs when the THETA camera is not communicating with OBS. You can replicate this error by completely unplugging the THETA from the USB cable and you’ll see the same error.